NASHVILLE, TN (September 10, 2015): David Weekley Homes is now open for sales in Navhville. Homebuyers can purchase David Weekley homes in Brentwood and Green Hills. 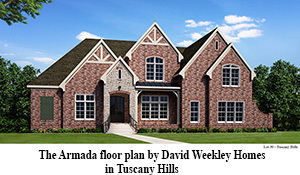 The builder has two custom-built homes for sale in Tuscany Hills in Brentwood. Located on Ravello Way, both homes offer granite countertops in the gourmet kitchen and all bathrooms, an upstairs wetbar, a spacious outdoor living area with fireplace, a hardwood staircase and more. Homes in Tuscany Hills include all-brick exteriors and are situated on one-third and one-half acre homesites. Homebuyers will enjoy a Community Amenity Center with a pool and walking trails, nearby cultural attractions and a future playground. Four Central Living by David Weekley homes are available in Woodmont. These low-maintenance homes provide convenient access to upscale shopping, restaurants, downtown and Nashville International Airport. All homes are located on Woodmont Boulevard in the Green Hills area, and offer four bedrooms, three full baths and one half bath on two levels. Woodmont is near Sevier Park, a 20-acre park with walking trails and a community garden, and Vanderbilt, Belmont and Lipscomb universities. David Weekley will soon begin building in Glen Echo in Green Hills and Durham Farms in Hendersonville. Glen Echo homes will offer Central Living homes close to downtown Nashville and West End. Located near Old Hickory Lake and Nashville International Airport, Durham Farms will offer homes on 50- and 70-foot homesites in a 472-acre mixed-use community. To learn more about David Weekley homes in Nashville, homebuyers may call 855-965-9065.